The Lenawee District Library (formerly The Lenawee County Library) has had a rich history in Lenawee County since its establishment by the Federal Emergency Relief Administration program in January 1935. At that time, it was one of only twelve libraries organized in Michigan and was located in the basement of the Adrian Public Library. Duplicate and discarded books from the Public Library and State Library, as well as donated materials, made up the collection of nearly five-hundred circulating items. It was only a few months later that the library was able to expand itself beyond the basement and into surrounding areas in Lenawee County. Addison was the first city in which a branch was rectified, followed later by Blissfield, Cement City, Clayton, Deerfield, Onsted, Clinton, Britton and Ridgeway (added last in 1958); some of these branches (Addison, Britton, Clayton, Deerfield and Onsted) are still a part of the Lenawee District Library and are thriving well as the heart of their communities. Amidst establishing new branches and librarians working without pay (due to F.E.R.A sponsorship being withdrawn) the library continued to grow and in 1949 the first bookmobile was purchased. This mobile library allowed literary services to be offered in rural communities and schools. Over the last sixty-four years that the bookmobile has been in operation, there have been a total of five purchased. The current one has been serving Lenawee County and surrounding areas since 2006. By 1951 the Lenawee District Library had ingrained itself deeply in the community and support flourished, allowing the library to purchase its first official headquarters building located on East Front Street. As the size of the circulating collection grew to well over 41,000 items, the need for extra space became essential. In 1959 land was purchased at the current West Maumee location and designs for a new library were started. Just a short two years later, the building was ready to be dedicated and in 1961 the doors of the 4,000 sq ft building were opened to the public. An addition was added to the library in 1984 and old walls were demolished in order to create a bigger space and make the library what it is today. Over the last few years the library has seen a decline in finances available. In order to combat the continuous funding and budget cuts, plans for a millage and conversion into a district library were started in 2012. The millage was voted on and passed later in 2013, transforming the library from the Lenawee County Library to the Lenawee District Library. The passing of the millage not only ensures that the library will remain open for years to come, but it also gives a bigger budget that will allow for the purchasing of new materials, a larger literary collection, extended hours and more programs. In 2016, study rooms were built in the old history room, providing quiet places for studying and meetings. 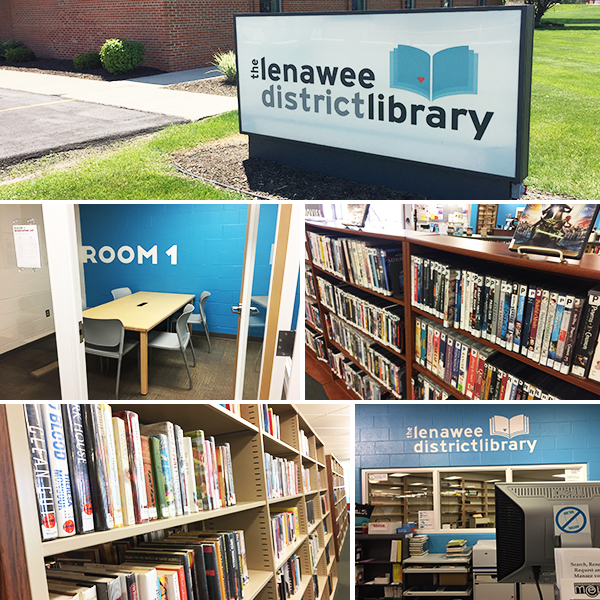 The Lenawee District Library continues to offer many programs and services to the community (including but not limited to) family storytime, adult programming, movie nights, Summer Reading Program, book clubs, and a monthly book sale. The size of the collection has grown to over 111, 000 items total with approximately 69,000 of those belonging to the Main Branch.